Recently we caught up with actor Julian Wadham, who plays the title role of the Minister in the epic sci-fi drama The Minister of Chance. We asked him about the making of the series, about his starring role in classic film The English Patient, and about his current role in This House at the National Theatre. Julian, how did you first hear about the project? 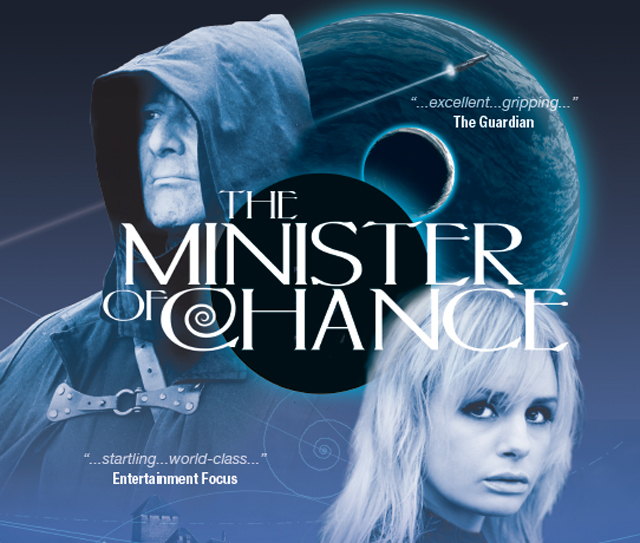 I first heard about The Minister of Chance when recording a radio drama with its creator Dan Freeman, who as well as writing, producing and directing, is also an accomplished performer. What do you make of your character The Minister? I immediately felt powerfully drawn to the character of The Minister. Like me, he is deeply flawed! It doesn’t help that he knows nearly everything (unlike me! ), and this makes him impatient, sometimes hilariously so, with lesser minds…. which, of course, is virtually all other beings. He has redeeming qualities though. He is a tireless and energetic champion for good. And he is touching in his own vulnerabilities, in spite of his regularly acerbic put downs to others. He appears to see the universe around himself with incisive clarity, whilst lacking self-knowledge. You’re best known for period pieces. Have you enjoyed a foray into science fiction? Having worked a lot in period drama, Shakespeare, and new writing, science fiction is a refreshing departure for me, and one which, to my amazement, I have loved ( I never, for instance, read it and rarely watch it as a medium). I think this is in large part due to Dan Freeman’s writing, which maintains a sense of mystery and open-endedness ( so anything really can, and does, happen ) whilst always staying intelligible and coherent. Each episode is atmospheric, humorous, pacey and intelligent. You have a lot of scenes arguing with Lauren Crace. What’s she been like to work with? I have a lot of scenes arguing with Lauren Crace in our respective characters, but never in life! The dynamic between the characters we play is one of the most appealing features of The Minister of Chance in my view: an older man with enormous knowledge of the universe but almost none of himself befriends and is befriended by a quick-witted sparky girl who, although largely ignorant of the ways of the universe, is so full of common sense, warmth and human understanding. This makes for a relationship at times both funny and touching. Julian Wadham and Lauren Crace. Design by Thomas Moulton. We would certainly agree! What elements of the story have resonated with you the strongest? As a parent for example, I have so often thought I held, or at least should hold some of the answers, only to find that my children are already so much wiser ! Did you know the full story when you signed up, or have you learned new things about the Minister with every episode? I never know where the story is leading, and in each episode I learn (as does the audience) a little bit more about the Minister’s world. The challenge for Dan as the writer is to maintain the inventiveness of each script without losing the coherence and credibility of the whole. A challenge it seems to me he has always met so far. How does audio drama compare to film and stage work? This particular audio drama is very different from conventional radio, employing as it does so many of the effects and soundscapes of the movies. It also manages to draw on its cast’s theatrical experience by being constantly rich in characterization, and dramatic in its plot lines. You played a major role in The English Patient. Did you have any inkling whilst making it that it would come to be so highly regarded? When making The English Patient I had more than a strong sense that it could succeed because of the quality of the writing, though of course, you never know that a good script won’t get lost in the process of translating it to the screen. I felt the same rehearsing James Graham’s brilliant play about politics This House, which is currently playing to great acclaim at the National Theatre. And I feel the same about The Minister of Chance. The thing they all have in common, is a highly intelligent and gripping script, with heart. You mention This House, which you’re currently starring in at the National. Can you tell us a bit about the play and your part in it? This House is set in the Whips’ offices of the House of Commons in the parliament of 1974 to 1979. Because it was a ‘hung’ parliament nobody expected the Labour Government to last more than a matter of weeks. But by clever ‘whipping’ and by making alliances with minority parties, it actually survived four and a half years; eventually giving way to Thatcherism. British politics has never in modern times been as passionate, dramatic, and at times hilarious as James Graham makes it seem in this brilliant new play, currently selling out in the Olivier Theatre. I play Humphrey Atkins who represents the dastardly tribal and patrician values of English post war upper middle classdom. The play manages to be both hilarious and serious about class warfare and its evolution, something few political plays achieve. It is unjudgemental. What does the rest of 2013 have in store? I never know what the future holds in store. Jobs only ever materialise, or just as often fail to materialise, at the last minute. I do always try though, to hold out for that elusive thing: a good script! Julian Wadham, thanks you for talking to us. You can download The Minister of Chance from the website. This House runs at the National Theatre until 30th March.